There are not many 15-year-olds who have the honour of racing at Mondello Park, at blistering speeds of between 90 and 100 miles an hour. But Dublin schoolboy Neil Shanahan is one of the lucky ones. This young third-year student, who races a 100cc CRG Kart is now on the first rung of a ladder which he hopes will eventually takes him right up to Formula One. Neil, from Churchtown, is busy gearing up for next week’s two-day go kart festival at Mondello. 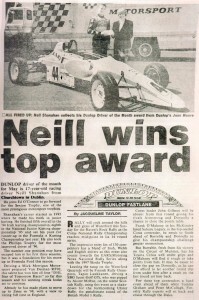 Dunlop driver of the month for May is 17-year-old racing driver Neil Shanahan form Churchtown in Dublin. He joins Ed O’Connor to go forward for the Sexton Trophy, one of the most prestigious motorsport trophies. Shanahan’s career started in 1993 where he made his mark in junior karting. 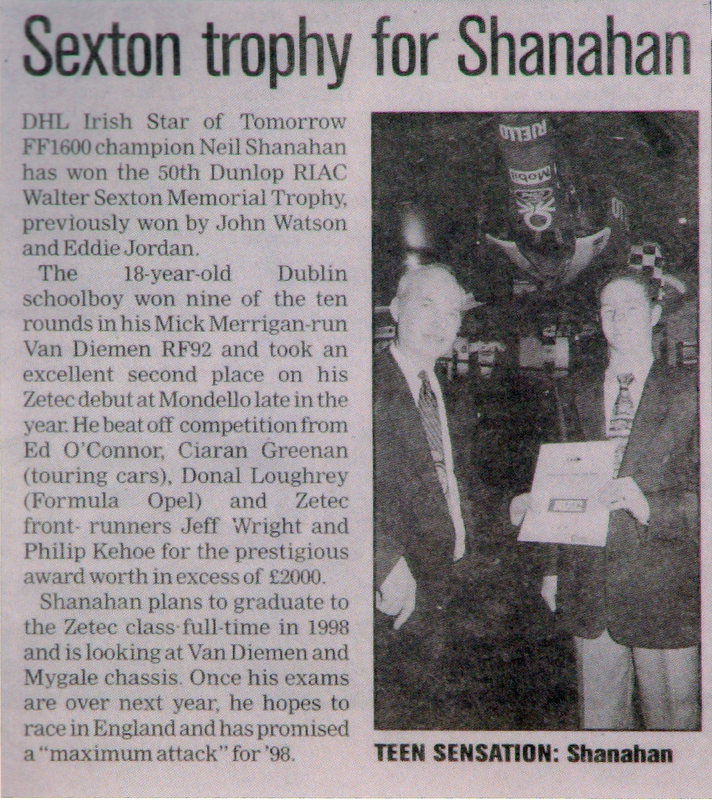 He finished fifth overall in the ’94 Irish karting championship, eighth in the National Junior Karting championship ’95 and set his pace for runner-up in the Formula A Karting Championship last year, He also took the Philips Trophy for the most improved driver of ’96. The number one position may have escaped him in his first three seasons, but it was a foundation for his move up to Formula Ford this season. Driving a Mick Merrigan Motorsport prepared Van Diemen RF92, this talent has won him all four “DHL Star of Tomorrow Races” so far this season and his winning streak looks set to continue. Already he has made plans to move up to Zetec in ’98, with a view to racing full time in England. DHL Irish Star of Tomorrow FF1600 champion Neil Shanahan has won the 50th Dunlop RIAC Walter Sexton Memorial Trophy, previously won by John Watson and Eddie Jordan. The 18-year-old Dublin schoolboy won nine of the ten rounds in his Mick Merrigan-run Van Diemen RF92 and took an excellent second place in the Zetec debut at Mondello late in the year. He beat off competition form Ed O’Connor, Ciaran Greenan (touring cars), Donal Loughrey (Formula Opel) and Zetec from runners Jeff Wright and Philip Kehoe for the prestigious award worth in excess of £2000. Shanahan plans to graduate to the Zetec class-full-time in 1998 and is looking at Van Diemen and Mygale chassis. Once his exams are over next year, he hopes to race in England and has promised a “maximum attack” for ’98. Watch for this rising star of Irish motor racing. Neil Shanahan is the name: he’s from Churchtown, Dublin: an 18-year-old Leaving Certificate student with a burning ambition to make it to the very top in a tough yet rewarding world of motor racing. 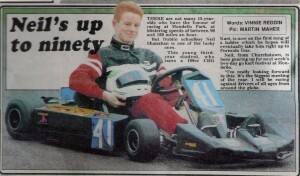 Red-haired Neil started karting when he was fourteen. In his three years with the Junior Karting chargers he won no championship, and yet he was awarded the Philips Trophy as the Most Improved Driver. In those days he was often hampered by poor machinery, by his own politeness or a simple lack of knowledge. That has changed! Neil Shanahan, with support from his father Liam and mother Mary, entered a learning curve this year that would soon catapult him to prominence within the sport. He started racing in Formula Ford 1600 and he swept to success as the winner of the DHL Star of Tomorrow. Recently he was selected as the winner of the RIAC Dunlop Sexton Trophy by a panel of judges. Shanahan was one of the six drivers chosen by the judges on a monthly basis since April last. The others were Ed O’Connor (Kildare) saloon car champion, Donal Loughrey (Dublin) Formula Opel champion, Ciaran Greenan (Dublin) saloon car racer, Jeff Wright (Bangor) Ford Zetec and Philip Kehoe (Wexford) Ford Zetec. So he had some major opposition. The Sexton Trophy – the highest accolade in Irish motor racing – could be the passport Neil Shanahan requires to shoot to the top of motor racing’s ladder. Winning nine times from twelve starts during the past season Neil outstripped more experience opposition and it showed in his racing maturity far beyond his tender years. Politeness off the track has turned into astuteness in a racing car! The Dunlop sponsored Sexton Award, which was announced on November 27th, comes to a young Dubliner in the form of a Scholarship. He will get a cheque for £2,000 from the Irish Dunlop, together with free travel to and from races in the UK from Stena Line as well a year’s supply of lubricating oil from Castrol. What a start for this young talent? 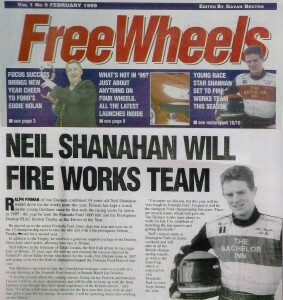 Polite, well spoken and groomed, yet burning with ambition to succeed, Neil Shanahan has two things on his mind for 1998. He wants to complete his Leaving Certificate, while at the same time he is determined to race here in the Ford of Ireland Zetec series. After June he will take in a few races in the UK to prepare himself for a full season there in 1999. Apart from the support of his family. Neil Shanahan has the guidance of Oisin O’Briain from the Champions of the Future organisation, and Mick Merrigan from Rathnew, Wicklow who prepares the car and guides him within the sport. A former racer and highly qualified motor engineer Merrigan is a key person in Shanahan’s future. Merrigan is convinced that he has a star in the making. He is also aware that the team are entering a slippery slope where money matters and along with which hard lessons must be learned with every turn of the wheels. Up to this Tipperary Water, Blaupunkt and the Bachelor Inn (his parent’s pub on Bachelor’s Walk) have been Neil’s main backers.